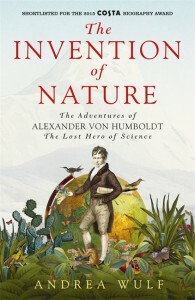 The invention of nature : the adventures of Alexander von Humboldt, the lost hero of science / by Andrea Wulf. Winner of Costa Biography award 2015. Why is this man not better known? That is the first thought which came to mind as I began to read this gripping and thoroughly researched biography, which is also a story of adventure, travel and history of science. 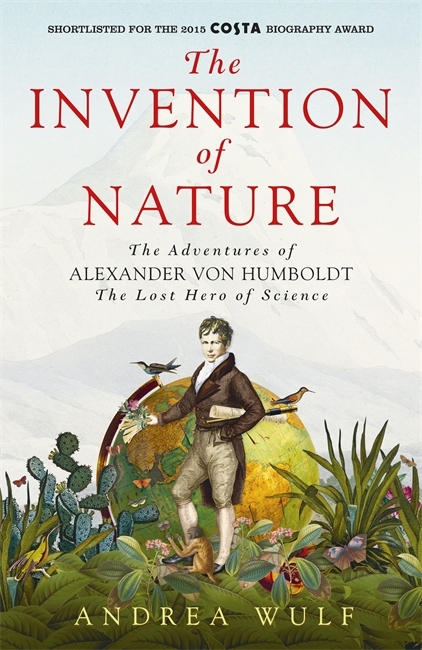 Alexander von Humboldt (1769-1859) was a remarkable scientist, traveller and nature-lover, who was called in his time the most famous man in the world after Napoleon. He influenced countless scientists and literary figures who followed him, including Darwin, John Muir, Charles Lyell, Henry Thoreau, Wordsworth and Coleridge. In compiling this biography, Andrea Wulf not only studied his correspondence and archives held in Britain, Germany the USA and South America, but also followed his footsteps to the far-flung parts of the world where he had travelled. Goethe likened him to “a fountain with many spouts from which streams flow refreshingly and infinitely”. That description captures Humboldt’s love and respect for the natural world, which he was determined to experience first-hand. Reading about volcanoes was not enough – he actually crawled along precarious ledges to peer inside one. He showed awareness of the interconnectedness of living nature, and of human impacts on the environment long before this became fashionable. His legacy lives on in place names, geographical and astronomical features and species of plants, animals and birds. Come into the Library and register as a reader to see our copy of this book, held in electronic format, and accessible on the premises.